my qualification is diploma in computers,can i apply for vro posts? How could I apply for VRO posts? Can i apply for government teachers posts without qualifying CTET after B.Ed? How to apply for vro posts? When is last date for applying? Re: Can I apply for VRO posts after qualifying in Diploma in Computers? To apply for VRO post, you must have completed 12th from a recognized board. You can apply for the post only if you have done diploma after your 12th. The lower age limit for the exam is 18 years. The upper age limit is 34 years for general category and 39 years for reservation category. The scale of pay is Rs.7520-22430. The written test consists of objective type questions of 100 marks. The questions will be asked from the intermediate level. The test includes 3 sections – General Studies (60 marks), Logical Skills (10 marks), and Arithmetic Skills (30 marks). The VRO exam will be conducted on 30th January 2012. The exam fee is Rs.200/- for general candidates and the processing fee is Rs.20/-. The candidates from reservation category have 5% concession on fee. You have to apply online through the official website of VRO. The last date to submit the filled application is 29th December 2011. You can download the hall tickets from 10th to 25th January 2012. If you have pursued diploma after completing your 10th, then you can apply for the VRA post. The minimum qualification required for VRA post is 10th pass. The age limit required is the same as the VRO post. The questions for the VRA exam will be asked from the SSC level. VRO stands for Village Revenue Officer. As you had completed Diploma course in Computers,so you are eligible to appear for VRO post.But,you must have to satisfy the eligibility conditions for the test. -You must have completed your Diploma course from a recognized Institute or any State Board of Technical Education. -You must not have any backlogs left in Diploma. The last date for Application forms is December 29,2011 and the last date to make the payment is December 27,2011. Written exam date for VRO -January 30,2012. Yes you can apply for vro post after qualifying in diploma in computer. Online form fill up started from 7th december and last date of submission 27th december. iam persuing my degrre can i apply now!!! 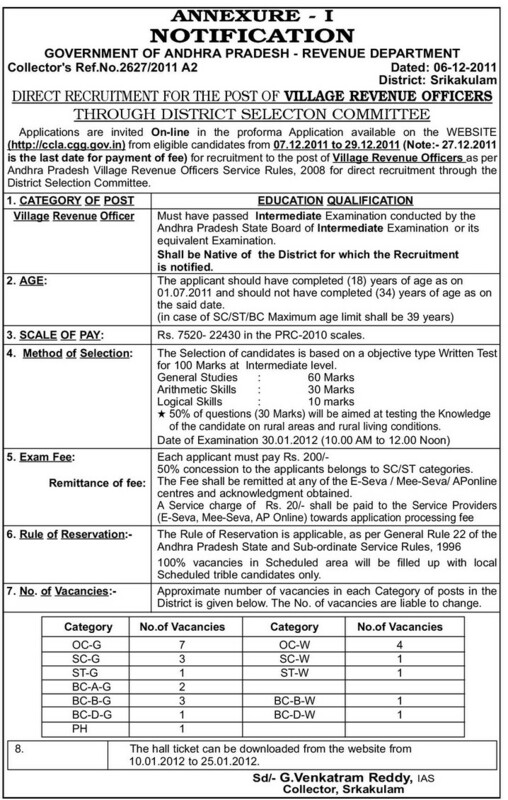 Yes students who have completed their diploma are eligible to apply for the VRO exam.It stands for Village Revenue Officer.Its departmental post for Revenue Department of Andhra Pradesh state.This year the vacancy for this is 1172 post .All the eligible students can apply for the exam.The notification for the VRO exam has been already declared. Date of notification Publication: 07/12/2011. Date for fees payment: from 7/12/2012 to 27/12/2011. Last date to apply for the examination : 29/12/2011. Date for Downloading Admit Card: Between 10/01/2012 and 25/01/2012. Date for written Exam: 30/01/2012. You should have pass senor secondary level or its equivalent class from a recognized board. Your age should be between 18 and 34 years. Relaxation is given to reserved caste students according to government rule . Since you have completed your diploma which is consider equivalent to 10+2.It means that you are eligible for the examination . For VRO post its Rs. 7520-22430. General Studies consist of 60 Questions of 60 Marks. Arithmetic Skills Consist of 30 Questions of 30 Marks. Logical Skills Consist of 10 Questions of 10 Marks. >> The candidates who have completed 12th from AP board or equivalent can apply for the post. LAST DATE FOR SUBMITTING APPLICATION FEE- 27/12/2012. COMPUTER DIPLOMA IS NOT THE MINIMUM EDUCATIONAL QUALIFICATION FIXED AS ELIGIBILITY CRITERIA FOR VRO POST. - You are only eligible for applying for VRO post if you have passed intermediate class or its equivalent class. - In the notification only intermediate/12th class is demanded. - There is no discribtion of any type of Diploma as eligibility criteria. 1. Educational: Candidate should possess 12th class pass or Intermediate class pass qualification. The school should be approved by the state government of Andhra Pradesh or should be its equivilant. 2. Age Releted: Candidate's minimum age should not less then 18 years on August 1st, 2011. On August 1st, 2011 candidate's maximum age should not be more then 34 years and for ST/BC/SC should not be more then 39 years. When are the posts available for VAO?